Oktober 2004. 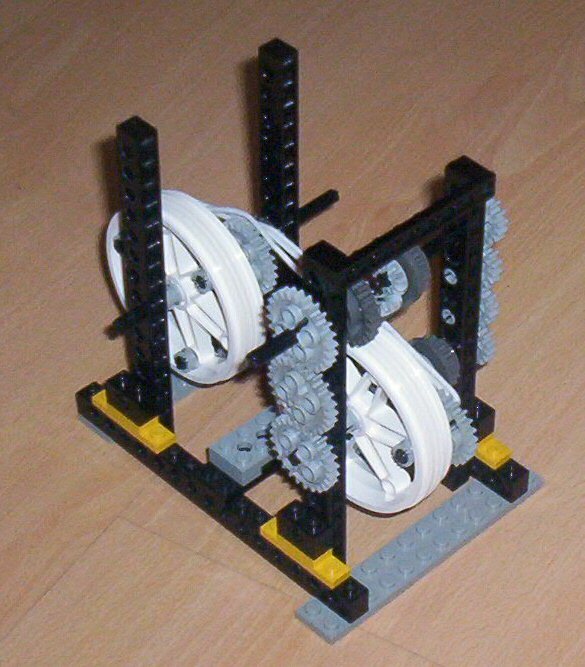 Inspired by the webpages on http://british.nerp.net/lego/, especially the Honda CVT, I started to think of new ways to change the diameterof wheels. In this experiment , I have found a way to change the size of a triangle. 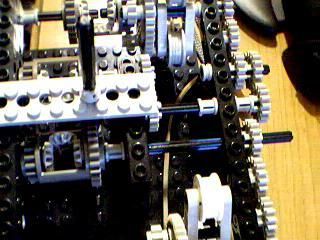 Then I decided to try if two rotating triangels and an elastic belt could make a variable transmission. By using an adder-subracter, I can control the size of the triangle independent of the rotation. The design for the adder-subtracter is conceived and explained by Denis Cousineau Since It appeared that I nedd 4 differenials for this design I could not finish this experiment. The next picture shows how far I got. The size of the triangle, consisting of three pins on the planet gear wheels, can be changed by rotating the upper right diffrential assembly. 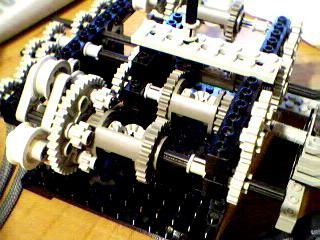 If the otation speed of the gears at frontand behind are equal the assembly does not rotate. 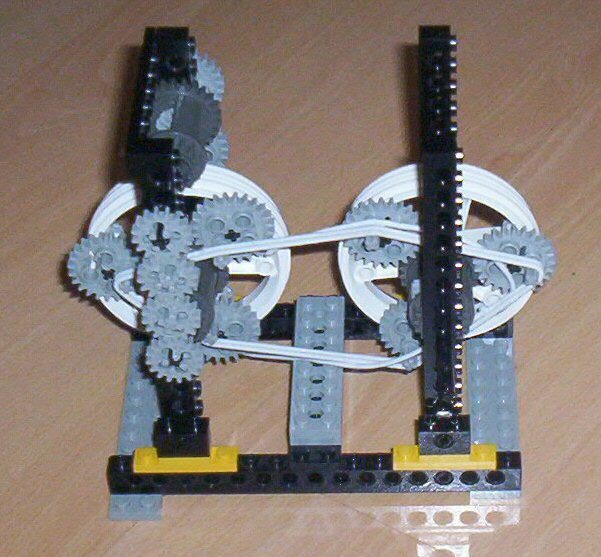 If the assembly is rotated, its speed is added up to the speed of the differential assembly wheel in the middle of the planetary gears. 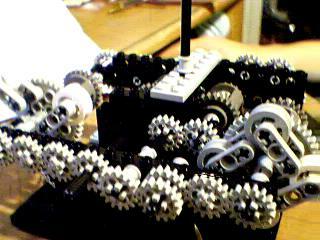 As a result the planetry wheels will rotate and change the position of the pins that make up the triangle. 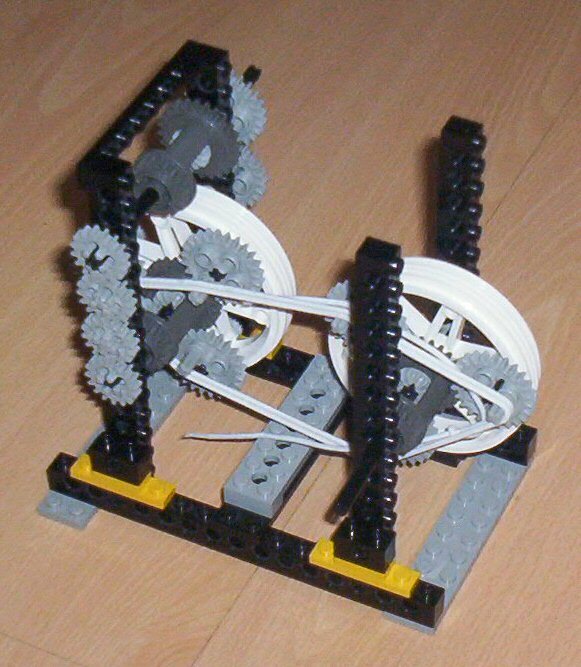 The planetry wheel can be rotated by any of the gears in front or behind. 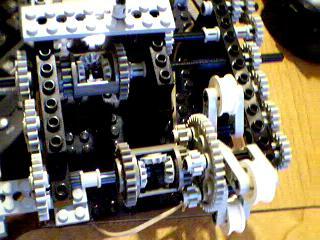 The structure can be competed by making the left side like the right side and a numer of gears to control both triangle sizes simultaneously. If the right triangle becomes bigger, the left triangle should become smaller. So, a completed version requires four differentials! Of course, I hope to finish and improve this design in the future. Pete, thank you for your pictures and your explaination!